Dani Carvajal believes Real Madrid's performances against Barcelona in the Copa del Rey and LaLiga didn't warrant two defeats. 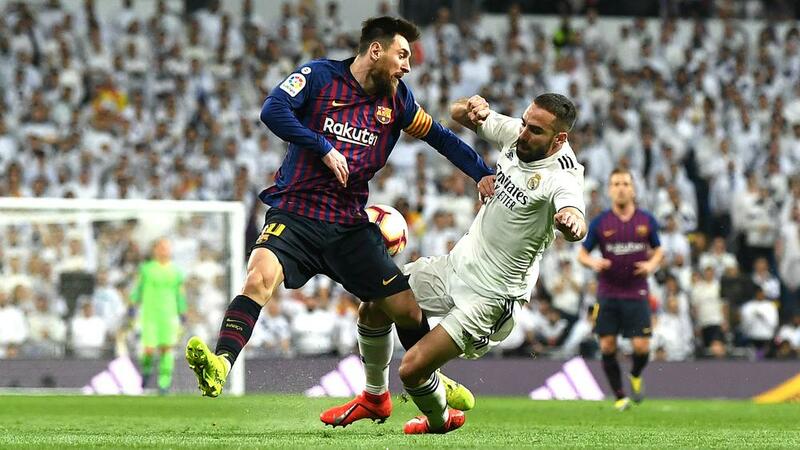 Dani Carvajal believes soccer is being "unfair" to Real Madrid as a home LaLiga loss to rivals Barcelona left them 12 points off the top of the table. After Wednesday's 3-0 Clasico loss to Barca in the second leg of the Copa del Rey semi-final, Madrid went down to Ernesto Valverde's men again three days later. Madrid, thrashed 5-1 at Camp Nou earlier in the season, had their chances but were wasteful in front of Barca's goal, where Marc-Andre ter Stegen had few saves to make. Sergio Ramos conceded Madrid's chances of catching Barcelona are effectively over after dropping points again, and Carvajal also believes his side's league hopes are dead in the water. "Soccer is being unfair to us in these two games in which we have had chances to win them or at least not to lose them," the right-back told reporters. "It is one of the hardest weeks. "We say goodbye to LaLiga and we were at the gates of the cup final. But now it is time to get back up and fight for the Champions League and the league, though the truth is that the advantage against Barcelona is almost final. "They have been two very intense Clasicos, even and matched, but they have been more decisive in the penalty areas. We are out of [the] cup and almost no options in the league. The Copa game was more open. "Today Barcelona has not enjoyed many chances, in the second half they have barely had the ball. We have had less because fatigue weighs on the legs. We have not been able to score and take the Clasico." "We had a very good and complete game, playing with our head," he said in the post-match mixed zone. "We had to win for the second time in a week at the Bernabeu, we have done very well. "It's a good blow for us, we had to win to keep Real Madrid away and keep points with Atletico Madrid, we played very well. "Every time we win a game we get closer to the league and we are already in the final sprint of the season. "Two defeats in a Clasico are difficult for any player, I am happy for the two victories, we have won twice without conceding goals and we have suffered to win. "We did very well, we had the ball in the first half and moments them in the second, but we have managed to handle the game well."